...the wood ties are to the top; the plastic below. In this same batch came (2) non-flexible 37" pieces of straight track with the "supports" towards the outer ends of the ties...with wood ties. I think on the one hand I prefer the look of the wood; after all, it has the wood grain (obviously!) By the same token, having those "supports" close to the rails makes them less noticeable...kinda. 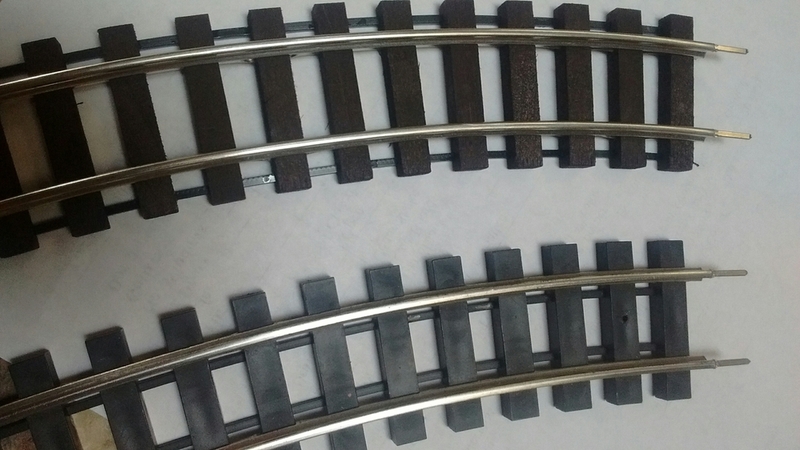 The Gargraves website shows the plastic tie track is available only in 3-rail O; S gauge sectional comes with wood ties only. Does anyone here know why this came about...or even care? The extra "supports" are made out of plastic in O gauge. The "supports" are used to keep the track in the curve radius, so the track would not change radius. You can cut the supports out, they are not glued in on O gauge track, just pressed in to the ties. The different locations of the supports between plastic and wood ties maybe from past experiences GG has had using wood vs plastic for ties. Keith: You're right; the ones used on S gauge track are plastic also. The way they are machined make them look like metal. The ones with wood ties indeed look to be a press fit; those with the plastic ties certainly look like they are glued in place. I'm loving this track! I now have enough to make an around the room large loop, and I'm seeing no voltage drop, even using just the single connection from the transformer.